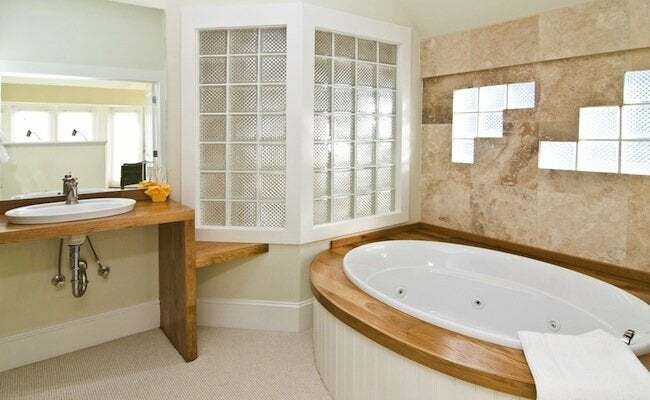 If you want to let light in while maintaining privacy, look no further than the glass block. It enjoys many applications, from flooring to shower stalls to skylights— and here are a few reasons why it just might be right for your home. Glass block has been used as a building material for more than a century, but it experienced a big surge of popularity in the 1930s and ’40s. That was when technological advancements made the blocks more durable and easier to install. Its use has risen and fallen over the years, but glass block continues to be valued for its strength and its unique ability to let in natural light while maintaining privacy. Some of glass block’s other selling points? It’s a far better insulator single-paned glass. Glass block is also easy to clean, it resists fire and impact, and it’s secure against break-ins. If correctly installed, it is long lasting and can be less expensive than traditional windows. These features explain many of the common applications for glass block, which include basement windows, non-load-bearing walls, skylights and partitions. Its translucence and easy care make it ideal for shower stalls. And glass block flooring is a great way to bring light to rooms below. Outdoors, it can be used for walls or wall accents, bars, deck features—wherever you need to add light or drama. And the good news is that glass block is an accessible material for a competent DIYer who wants to let in some light.